These Omega fatty acids are derived from fish, borage seed and flax seed oils to create Country Life's unique supplement oil "multivitamin" formulation. Two softgels are packed with 800 mg each of fish oil concentrate, non-GMO borage seed oil, and non-GMO flax seed oil. The fish oil, derived from anchovy, sardine, mackerel, herring, salmon, and tuna, has been processed using molecular distillation to ensure its purity. The plant oils were also 100% expeller pressed without hexane or harsh chemicals. This product also does not contain any trans fatty acids. 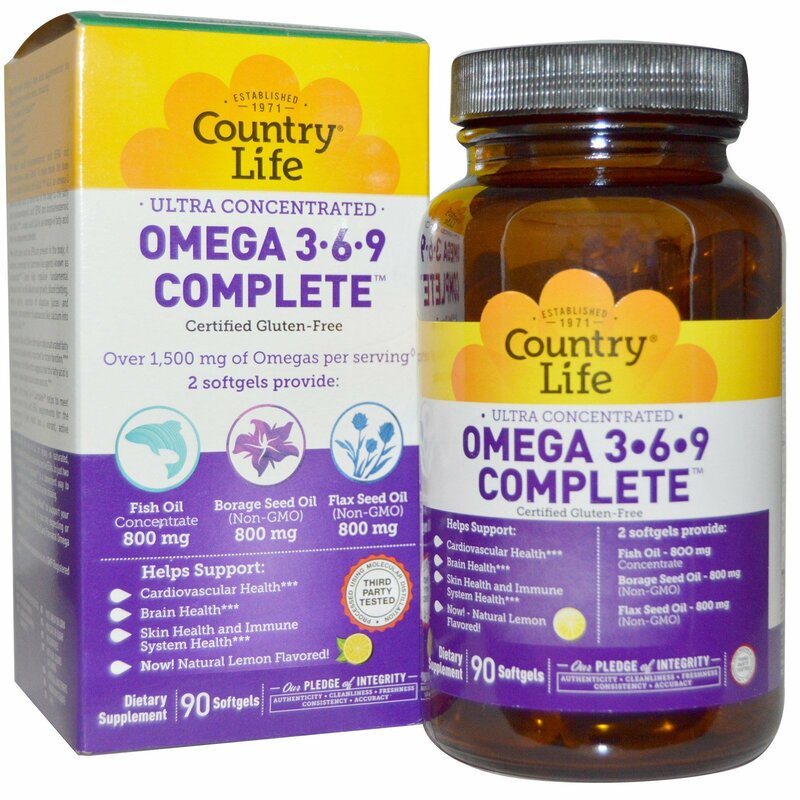 Country Life's Omega 3·6·9 Complete are made according to high quality and exacting standards. The body needs eicosapentaenoic acid (EPA) and docosahexaenoic acid (DHA). To make these, the body requires alpha-linolenic acid (ALA). ALA, an omega-3 essential fatty acid, is converted in the body to the fatty acids eicosapentaenoic acid (EPA) and docosahexaenoic acid (DHA). Linoleic acid (LA) is an omega-6 fatty acid that also complements the diet. The omega-3 fatty acid DHA is the major polyunsaturated fatty acid found in the brain and is important for brain function. Synapses are rich in DHA, which suggests that this fatty acid is involved in signal transmission along neurons. Country Life's Omega3-6-9 Complete helps to meet daily essential fatty acid (EFA) requirements for the maintenance of good health and a vibrant, active lifestyle. People with diets low in fat or heavy in saturated, hydrogenated, or trans-fat may be deficient in EFAs. In just two softgels, Omega 3-6-9 Complete is a convenient way to supplement your diet with the EFAs it may be missing. Also try Country Life's Omega Mood to support your emotional well-being. Or if you are expecting, pregnant, try one of Country Life's Baby Care Prenatal Omega 3-6-9. 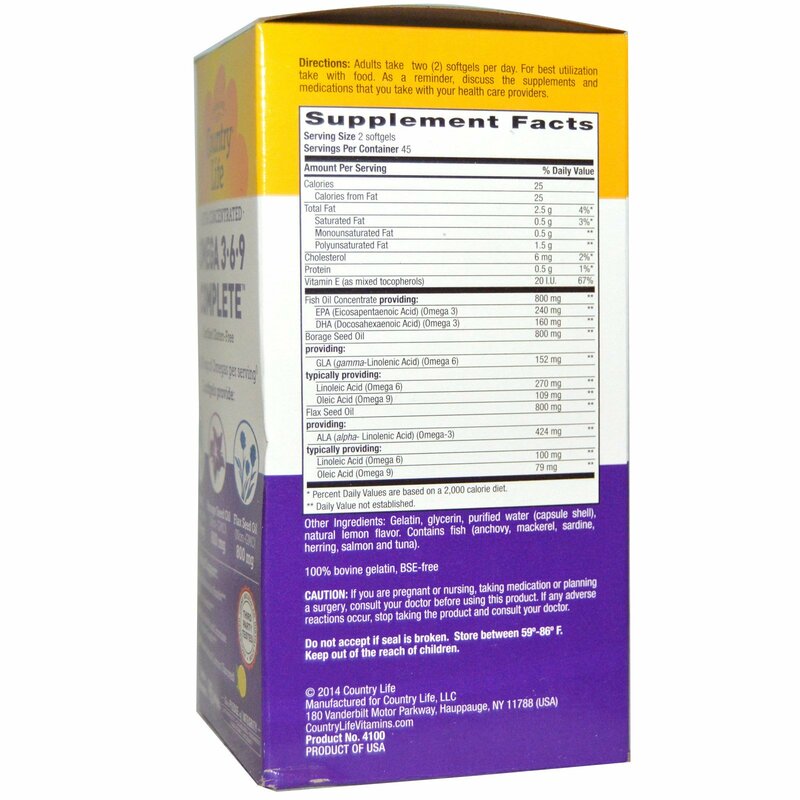 ◊ Provides 1,534 mg of Omega 3,6 and 9 fatty acids. Adults take two (2) softgels per day. For best utilization take with food. As a reminder, discuss the supplements and medications that you take with your health care providers. Gelatin, glycerin, purified water (capsule shell), natural lemon flavor. Contains fish (anchovy, mackerel, sardine, herring, salmon and tuna).